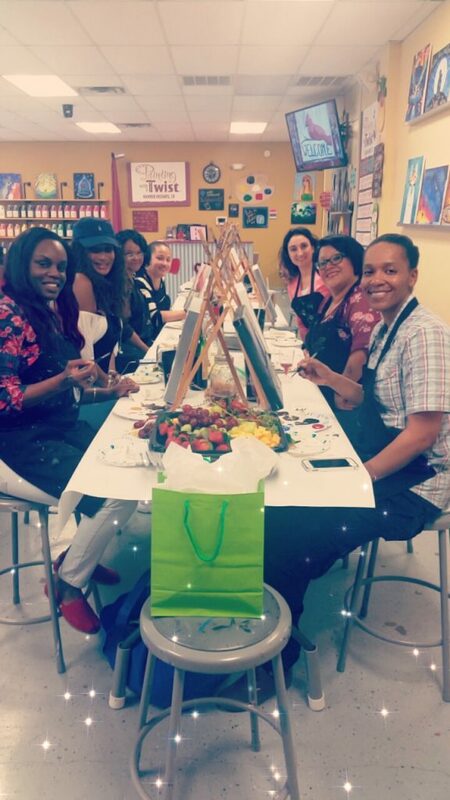 A group of women gathered at a Painting with a Twist venue in January 2018. Study the photo then, click here where you will find SONGS written by each one of these women. Songs about combat, suicide, resilience, the pride of being a soldier and sadness of transitioning out, mascara, and much more. Yes, these women are U. S. Military veterans, some active-duty. Most of them did not know each other before attending a SongwritingWith:Soldiers retreat in May, 2017, near Fort Hood. Eight months later, they are gathered here, as they have done several times since the retreat. Supporting each other, inspiring each other. Having fun, something that didn’t come easily for many years. At the retreat, they not only wrote songs, they attended creativity workshops, meditation sessions, coaching sessions to zero in on their unique strengths — and hung out together, sharing stories. Thank you, Angel Muñoz, for sharing this special moment with us. Our mission at SongwritingWith:Soldiers is to use collaborative songwriting to build creativity, connections and strengths. This photo shows the reason why. ← Weapons of Mass Creativity – What if?